All aboard! this kids classic toy train is ready to Chug into your home station! family, friends, and hobbyists alike will delight in the realistic train noises, working engine, and realistic smoke that blows out of the chimney. Whether for play or decoration, this nostalgic train set is sure to delight. Choo choo! specifications: package dimensions: 69”(l) x 49”(w) x 3”(h); cabs (each): 7”(l); weight: 2 lbs. 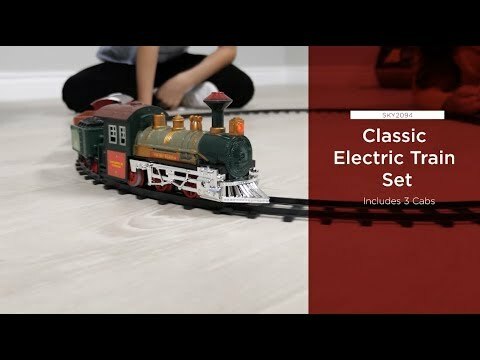 ; requires 4 AA batteries (not included); astm-certified; recommended for children 5+; color: Multicolor; some assembly requiredElectric train set comes to life with authentic sounds, lights, and real smoke that blows out of the locomotive!